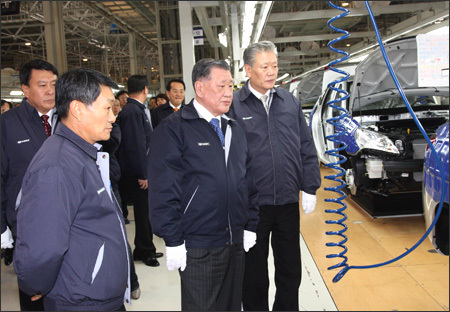 Hyundai-Kia Automotive Group Chairman Chung Mong-koo, second from left, inspects the production line in its Beijing factory, last November. Under the stewardship of Chung, the carmaker is focusing on the Chinese market. Denying lingering skeptics, the Hyundai-Kia Automotive Group has recorded another successful year in the global auto industry. In 2009, they combined to account for 7.7 percent in global market share, with Hyundai breaking the 5-percent mark for the first time. Hyundai and Kia together sold 4.7 million vehicles overseas, up 11 percent from the previous year. Buoyed by this remarkable growth, the No. 1 South Korean maker set an ambitious goal of 5.4 million vehicles in overall global sales and a share of 8.4 percent of the international market this year. For this end, the auto giant plans to invest 10.5 trillion won ($9.4 billion), up 12 percent from a year earlier. This is the biggest budget ever earmarked, with 4.6 trillion won on research and development and 5.9 trillion won on upgrading facilities. Such an expansion in investment is expected to contribute greatly to the national economy by creating more jobs. The business group plans to hire some 5,000 new workers this year, including around 1,000 employees for the development of eco-friendly vehicles. Progress is ongoing for those new products, arguably the hottest ticket in the industry. Hyundai plans to release a gasoline hybrid sedan in the North American market this year, followed by a diesel hybrid model, scheduled for next year. It is looking to unveil the first commercial electric vehicle this summer. By 2012, Hyundai-Kia aims to complete an entire production line to churn out eco-friendly cars in a bid to make South Korea one of the four largest producers. The company expects that the launching of the new models in overseas markets will enhance its position as a leading global carmaker combining quality products with localized marketing strategies. Advertising Age, a renowned U.S. publication, selected Hyundai Motor last year as the "Marketer of the Year." About 40 percent of its readers chose the carmaker as the top marketer of all industries in the U.S. The success of a surprisingly bold campaign with a new assurance program, which guaranteed customers to be able to return newly bought cars with no credit damage in the case they lose their income this year amid the still prevailing financial crisis, helped the Korean maker attain the throne. With that bold victory, Hyundai ``began in earnest a frontal assault on a recession that was not dampening consumer enthusiasm but drowning it,'' Advertising Age said. Hyundai further pushed its efforts to push the Genesis luxury sedan in the U.S. by purchasing advertisements for the nation's two major events, the Super Bowl and the Academy Awards. The Super Bowl campaign also included the first advertisement for Kia's Sorrento R sports utility vehicle (SUV). The overall result was surprising. Sales and market share went up, and its brand was image overhauled. Hyundai's market share jumped to 4.3 percent in the first ten months of 2009 from 3.1 percent, year-on-year. Even in September, while the industry suffered a hangover from the ``cash for clunkers campaign'' with a 22-percent drop in sales, Hyundai managed to increase its new-vehicle tally by 27 percent to 31,511. Hyundai's marketing blitz in the U.S. will be sidelined with Kia's spurring production, as Kia completed the long-aspired Georgia plant in February. Currently, the Sorrento R SUV is manufactured in the factory in West Point. Kia plans to create some strategic brands targeting the local market. Through stable supply from the plant to better meet market demand, Kia expects to improve its profitability in the United States and promote the corporate image as well. It sold 8,270 Sorrento SUVs there in February, overtaking the RAV4 by Toyota and the Equinox by Chevrolet. Hyundai-Kia Chairman Chung Mong-koo visited China in November last year to encourage the maker's Chinese units, stressing the significance of its market. ``China will be the biggest battleground for Hyundai-Kia,'' Chung said at the briefing for Beijing Hyundai and Dongfeng Yueda Kia. ``We have posted decent performances here, but shouldn't become complacent. It's time to do our utmost to become a leading maker in China." Thanks to the tax incentives from the government, China became the biggest auto market in the world last year. This year, the industry forecasts its overall market size will grow 5.3 percent to 13.6 million vehicles. Hyundai-Kia sold 436,514 vehicles together in China in 2008, and raised the tally to over 800,000 last year. It's mainly attributable to the successful development of localized products, the company says. It released the first local product, the Yuedong, a local edition of the Avante compact sedan, in 2008 and the i30 small family car last year. For Kia, the Soul crossover vehicle is set to be unveiled this year to enhance its Chinese lineup along with the Cerato and the Forte compact models, released in 2008 and last year respectively. Response from the market is positive for those products, as Hyundai topped automobile makers in the annual quality satisfaction survey by the China Association for Quality, a leading consumers' organization there. Since its earlier days, Hyundai and Kia have put much weight on customer service. In 2008, Hyundai announced the debut of its ``customer-happy management'' and launched a localized after-purchase service program. Like other global players, sales of Hyundai cars suffered a setback in European markets last year. It sold 286,000 vehicles there, down 10 percent from 2008. However, the company plans to pan out more promotions this year in its forecast for higher demand of smaller models, amid high fuel prices and strengthening environmental standards. Its i- series is expected to spearhead the regional sales as a strategic model to capitalize on the segment for small-sized models, the biggest demand among European motorists. Adding to the growing sales of the i10, the latest models of the i20 subcompact are expected to maximize the maker's market dominance. In the center of its marketing strategy are incentive programs for scrapping old cars, which are implemented in various European countries. Hyundai looks to appeal to customers there with replacement demand for their vehicles, in enhanced campaigns for the two small models. Hyundai plans to run a customers' group in major countries to experience a new diesel model for the i30 car, production of which began last month in its Czech plant. Kia looks to expand its sales led by the C'eed, a European local product manufactured in its Slovakian factory. One of the most popular compact models in Europe, the C'eed has sales tallied at over 120,000 for the past three years. Its latest edition, the C'eed ISG, is equipped with a new technology that saves fuel consumption by up to 15 percent in urban driving circumstances. Kia expects the new model to consolidate its European sales base.